Free Ethics CEU Event in Plano, TX on Jan. 31st – RSVP soon as space is limited! Determining your role as a BCBA when ethical challenges arise with the implementation of feeding programs. 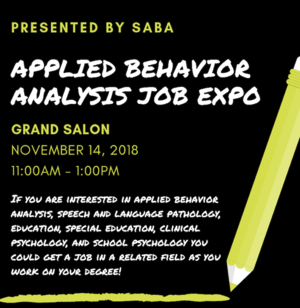 SABA (Student Association for Behavioral Analysis) of Cal State Northridge is hosting a Job Expo featuring over 15 agencies who are looking to hire undergrad/postgrad students and Behavior Frontiers will be there meeting new candidates! This is a great opportunity to get a job in a field of psychology while you are working on your degree. Come with a resume! Behavior Frontiers will be attending the 13th Annual Autism Conference in San Francisco, January 18-20th. This exciting conference offers presentations by the foremost leaders in the field, continuing education, seminars, workshops, and many other diverse learning opportunities. It is a wonderful a chance to meet with practitioners, trainers, administrators, consultants, researchers, and graduate students committed to the study and treatment of autism. We invite you to stop by our booth (#112) and meet with our enthusiastic staff members and leadership. For registration, visit ABAI.